We have located—and are now storing—78 complete computer workstations, cpus monitors keyboards and mice, former institutional machines with very slow 497mhz processors and 256MGs of RAM (perfect for googling and emailing), which Lincoln Thompson and I will transport to Miami on March 20 to ship to Montego Bay to be then transported into the mountains of Trelawny, Jamaica, to their destination: Brampton Township and the 78 households of the students of Brampton All-Ages Primary. As previously reported, Lincoln is the husband of Camiel West-Thompson, principal of the Brampton Primary. Up until now, we have collected and delivered 20 workstations. Of those, eight have survived the learning curve (shipping, age, first time computer-users). Then, an opportunity opened up. 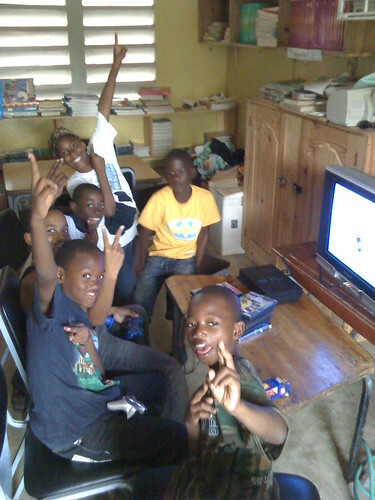 We can ship a computer to each household of the students of Brampton Primary and the Brampton, Jamaica Township. 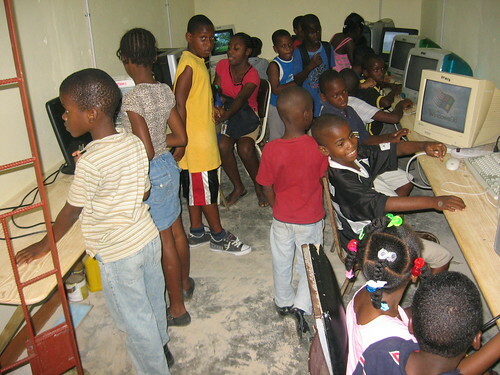 This is a community which up until last year had no computers. In other words, working with the community—who came together to build their children the school’s amazing computer room—Key West is giving a hand’s up to island neighbors who are meeting us halfway in providing children with opportunities. As an ethical person, I feel it is my moral obligation to meet these people the other half of the way. But there is more. We are using the arrival of the computers as incentive for Jamaica and the region’s strongest internet provider, LIME, Land Internet Mobile Entertainment (formerly Cable & Wireless), to extend service one mile to Brampton Primary and the children of Brampton. By providing the children and households with their own computers, we are developing a demand for internet and computer services. LIME is hard-pressed to ignore the positive publicity value nor resist the allure of 78 households of potential, loyal LIME customers. In other words, shipping these computer workstations very much equals introducing real internet, Google, and emailing to the students and parents and families of Brampton Primary. Here is where I need the help. Up until this point, Lincoln and I have personally paid for all of the expenses. Collection, storage, refurbishing, transport, shipping, drivers, customs, plane tickets, etc etc etc. The advantage of doing it this ways has been in allowing for the benefactors of this effort—the Bramptoners themselves—the opportunity to develop a unique internet culture, to develop their own individual and cumulative internet “personality,” and to get their legs and stand and walk on their own with minimal outside influence. But now, here we need a hand. It is going to cost over $2000 to ship the 78 workstations. It is three palettes of computers, monitors, and peripherals. They are transported to a shipping agent in Miami, and then by cargo ship to Montego, Jamaica. For me, that’s a lot. So here is the help we are requesting: Can you (or your friend or your business) sponsor one computer’s shipping with a gift of $25? I’ll even send a photo of the recipients with their new computer. With your name on the computer. I have set up a PayPal button—see below—to make giving simple. To have your computer identified, just write your name in the “special instructions” field. That’s it. $25 is what I am asking for from you. Believe it or not, you may only be one person “gifting $25” but each gift helps more than one person; it helps an entire world by helping one small rural township by helping the kids of the community help themselves. Thanks to for all the kind words, emailed letters of support and all the good feedback. Next step, here we go! At the behest of Bridget McDonald, Program Coordinator for Green Living & Energy Education (GLEE), I attended the Key West city council meeting this past Tuesday. The matter at hand was Key West’s recycling ordinance sponsored by Teri Johnston to make recycling mandatory. If you missed this meeting, watch it on cable television. If you don’t have a teevee, make a point of finding one. Because in the decade since I have returned to Key West, what took place Tuesday night was electric. If after seeing that meeting you are not grateful for the leadership of Teri Johnston, Barry Gibson, Morgan McPherson, and the inimitable Clayton Lopez, then my advice is simple: Move. Because these are elected officials, and on Tuesday night they earned their titles ways which lend credibility to the ideas and values of Key West and of America. In other words, if you didn’t get it Tuesday night, you may be living in the wrong countries—USA and the Conch Republic! Our mayor, Morgan McPherson, stood for what is right in a way that honored the role he fulfills in a manner which would do proud Bobby Kennedy or Wilhelmina Harvey. Or even Dennis Wardlow, infamous for declaring the Conch Republic a sovereign nation and in attendance to speak his mind on the matter of the ordinance. It began, “I can imagine, once not so long ago there gathered a group of people and before them stood a single individual who stood up and said, ‘Let us go to the moon.’ So to must we look to the future. But it is not only a mayor who makes decisions in a democracy. In the Key West city council, there are six council members elected to represent us and our island population’s wishes for the direction of Key West. In fact, it was not Mayor McPherson who even spoke first. Rather, it was all the council members, each having heard the arguments for and against, each who presented their own understandings or misgivings about the ordinance. Leading off the council members speaking after hearing from the voices of those present in the room (as well as those who sent in letters) was Barry Gibson. Barry takes the hard decisions hard. He is open about the difficulty of the decision-making process, and eloquent about how he weighs both pros and cons. He gave a lengthy dissertation about how and why he supports recycling but was concerned about it being made mandatory. His position was unclear but it sounded as if he would probably not be voting in favor the ordinance. Next Dan Kohlhage, who is well-regarded for his generally practical and fiscal-minded nature, spoke on the matter. He was against the ordinance. He didn’t believe the information posed before him/that recycling would save the city $800,000 to $1.2 million annually, and furthermore announced as he read it, it would cost the city $145,000 to provide containers to the seventeen thousand residents. Kohlhage felt that education was the answer. Kohlhage was followed by Bill Verge. Verge who was elected on a platform of ecology and support for green concerns quickly showed he was no friend of the bill, feared that he “wouldn’t be able to pick-up and throw away a ham sandwich on his properties without getting a ticket,” and denounced the bill as having the potential to pit neighbor against neighbor. Mark Rossi came next, and while Mark Rossi is generally well-loved and respected his performance at the meeting was a mystery. He was against the bill because “he can’t recycle because Anheuser-Busch no longer makes returnable bottles,” and “Florida should bring back returnables.” What was so mystifying is what Mark was so upset about. 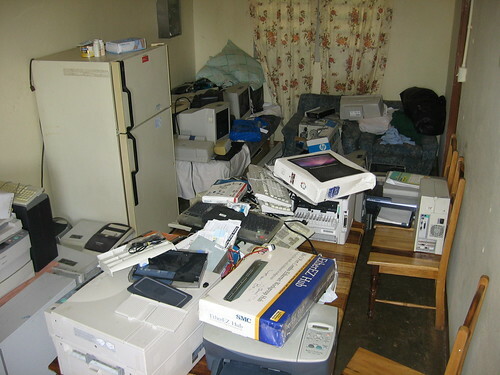 It was as if he felt guilty for not doing anything to recycle anything at his popular establishments. What more, it was as if Mark was portraying himself of recycling only means returnables and now someone had taken that out of his hands and he was mad. It was befuddling to all present. Of course, Mark can recycle. In fact, his recycling would lead to such amazing publicity for ALL his businesses—Rick’s, Durty Harry’s, Angelina’s, Red Garter, etc. Even if he only recycled the aluminum much less ALL THAT GLASS think of the impact and positive approval and world-wide publicity Mark’s business’ would garner. But Mark announced he was voting no. Next up, Clayton Lopez gave a position which was complex in thought and feeling, and honest. Clayton wanted to be for the proposal but again the misgivings about it being mandatory. He spoke as he is his calling card of community and community values. 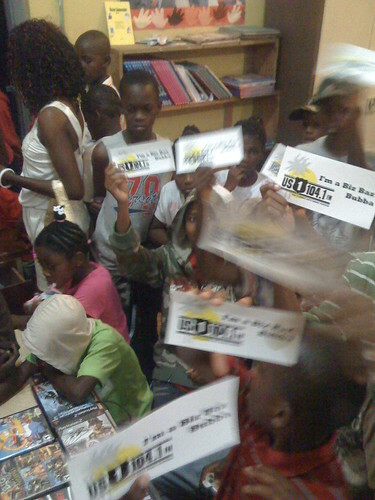 In the room, a trail of young pre-teens who had sat and listened patiently as well as delivering their own impassioned pleas to pass the bill, touching speeches—no less impressive than the dual roles of double-sided signatured petitions which had together earlier been stretched from one side of the room to the other—got up and left. It seemed the cause had been lost. Their departure had its own impact. Against the backdrop of the adults arguing for and against recycling in the room, it appeared as if the future had got up and left the room. It was at this point, Teri Johnston, sole female council member and sponsor of the bill, spoke and addressed—point by point—any and all concerns of her fellow council members. She then clarified that there would be an entire year, working with all the groups and volunteers and city officials and employees and Waste Management itself, to insure a smooth transition from Key West’s present recycling rate of 6% to something like 60%. And here Mayor McPherson issued his earlier-referenced position. Additionally, he said before all that he himself was against it but that it was none other than GLEE vice-president Jody Smith-Williams who had changed his mind and convinced him by taking the time to prove to him the good sense of this ordinance. Kohlhage didn’t buy it. Mark Rossi returned to his off-topic position that he was against mandatory residential recycling because the State of Florida should make returnables again so his businesses “could recycle.” (?) Clayton re-stated his thoughts. But Bill Verge when it was his turn was practically fuming. Yet Verge’s pronouncement drained the room of common sense, leaving what felt to be a veritable vacuum of intellect. Then Teri Johnston spoke once again, and again her measured and well-informed responses dispelled the heavy mist of ignorance which seemed to shroud us all, and again all were left with the impression that not only was our cause conscientious but that each of us in the room wasa sensible member of a forward-thinking humankind. It was at that moment, after over three hours of meeting—half of which was dedicated to the matter at hand—that Morgan asked if there was a motion on the floor. And Teri Johnston motioned for the ordinance to be approved. With only Teri and Morgan’s outright support, it seemed as if the ordinance was dead on the floor. The emotion in the room was drained and low. In fact no one seconded her motion. Until, with a show of unsuspected verve, Barry Gibson seconded it! It was a pleasant surprise but in truth it had the appearance of second-place. A good effort but in the end unsuccessful. And that is when the most impressive moment I have ever seen at a city council meeting took place. It was a moment of pure adulterated faith hope and love. It was now clear that whatever would happen would depend on Clayton Lopez. Clayton Lopez. Remember that name. I will. I will be telling children his name for years to come. And at that, his head turned quickly, his eyebrow raised, and a smile lifted the left corner of his mouth. And suddenly the heaviness left the room, and the lightness that was in all of our hearts flooded it, flooding it with the joy present from the victory our nation earned by the work we all did to get Barack Obama voted president and here was yet another one of those moments happening again! And there were smiles on all our faces. It was that day again! And the room erupted as a hundred people bolted up and lept to our feet. And a great cheer went up that lasted and lasted. And everyone laughed together and shook hands and patted one another on the back, and like I said it was amazing all over again. At that point, the mayor declared a five minute recess, and the room spilled out onto the street. Victorious. Fulfilled. And that is how it happened Tuesday night at the city council meeting at City Hall, Greene Street, Key West. Find the video. Take a look for yourself. Clayton Lopez, you are my hero. Mayor McPherson your right up there with him. And Teri Johnston and Jody Smith-Williams, on behalf of Key West, thank you. And I am tired but happy. 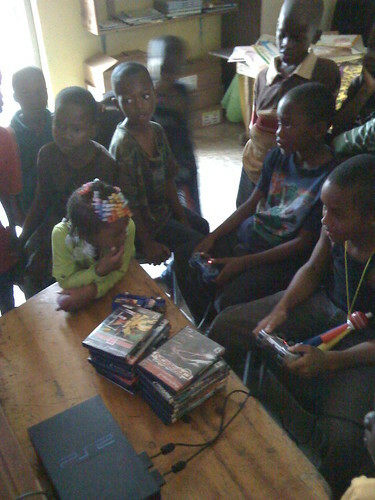 I’ll report more later about this trip and the new computers we brought (and the high-speed internet that is on its way) but for the time being let me send Brampton Primary’s thanks for its receiving of the very special gift by US-1 Radio’s Mark Ryno Masca: His own personal PlayStation2 videogame system along with 15 videogames. In part because of his generosity, Brampton Primary managed to raise $52,000 JA (about $900 US) at this year’s end-of-the-year concert. So how did the PS2 figure in? It was used to generate money by kids playing games during at the event. It was one of the event’s central attractions! The concert—which is like a variety show, carnival, and dance all tied into one—is the single biggest fundraiser for the school, and this year became its most successful year in the decades it has been holding the event. Imagine $900 US being a large part of an annual budget. That’s why this videogame system was so important. And I had promised it to the school. However, when the PS2 system I was bringing turned out to have a unfixable faulty laser, I became frantic. It was too late for me to order one off of eBay even. 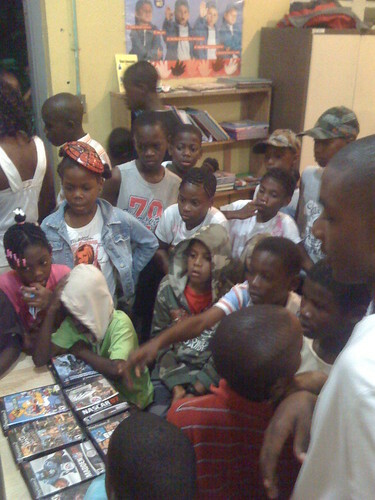 (The school had requested a PS2 specifically to use to raise money, as they had some games of their own already.) So I called Biz Baz and put out a request. I listen everyday pretty much, part of my morning routine. Subsequently, Mark, Foxy, and Bill Becker are like friends to me. It’s great radio. And gratefully, they had read the story about the school and this effort in the Key West Citizen. But when Mark said he’d pony up his own system, I was flabbergasted. I was overcome by joy and relief, it was as if a tremendous weight had lifted off my shoulders. I had to fight back tears and just say thank you thank you thank you. 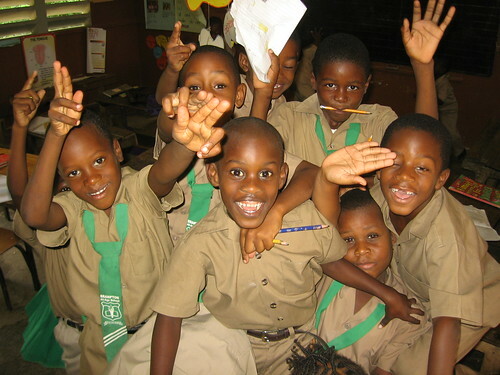 To me, the 778 students at Brampton Primary are like my own now. The idea of failing them was unthinkable. And a it turns out, my belief in them was well-founded. 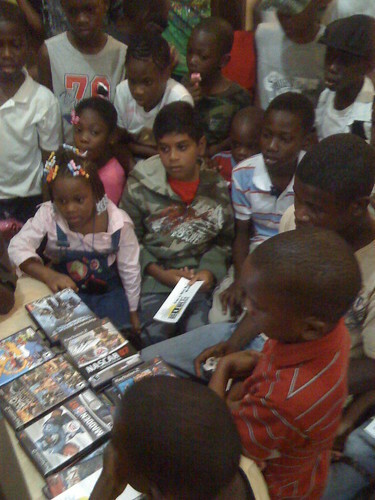 Along with all the other activities set-up for the concert/carnival, the many, many kids all together played videogames for hours (at $30JA/.50¢US an for 10 minutes). When I was told that it was an important part of their fundraising, I could only imagine but I had no idea what to expect. Again, I was profoundly surprised. 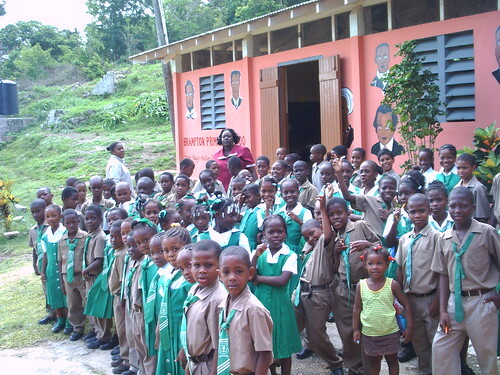 For me, this Jamaican experience is one surprise after another. But pictures tell a better story. I have much more to share about this trip but right now before Christmas I wanted to say thanks to Mark and Foxy and Bill Becker and US-1 Radio, for coming through as they did, and extra-special thanks to Mark. I hope you can see from the photos below just how significant a contribution you made to a great bunch of kids you have never met but who I believe are among some of the best in the world. …and plays late (4 hours later). …then its back to business!